On the second Sunday of the month, families and parishioners of all ages gather together for brunch and discussion or seasonal activities. In the past, these brunches have involved making care packages for the homeless, exploring labyrinths, decorating cards and cookies for the women of Noel House, and creating Lenten practices to take home. Check Sundays and Beyond for specifics each month. During 9 a.m. Sunday worship, children preschool age through second grade have the opportunity to participate in and enjoy Children’s Chapel in the beauty and reverence of Thomsen Chapel. This service replicates what is occurring in the Nave in a particularly child-friendly way, and helps children develop the language to talk about prayer, the Bible, and liturgical elements of our Cathedral worship. Parents are always welcome! We exit together after the Gospel reading and return at the Peace. Join us for our annual Advent Event, Mardi Gras Pancake Supper, or Pentecost Run/Ride/Roll! Stay tuned for information about Summer programs. These family centered events will be noted in the monthly Children's and Family newsletter and in Sundays and Beyond. 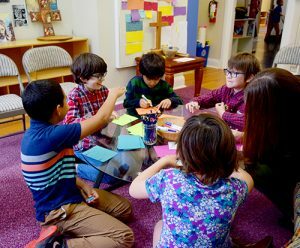 Saint Mark’s is a Christ-centered community that welcomes all children. We encourage families to worship with their infants and toddlers at all services. At the same time, the cathedral offers this option for young children and their parents to meet same-aged peers and provide for a variety of options for worship and study. The Child Care Center is a warm and safe environment located in the main building of the Cathedral. This space is staffed by two loving adults, and includes large and small motor development toys, picture books, and art. Children enjoy having time to play and being read to in the comfy reading corner. For children 3 months through age 5. No reservations are required for Sunday mornings. Anyone working with children at Saint Mark’s must successfully complete the Washington State Patrol background check and specialized training. Special Event Childcare:Available for children ages 3 months through 13 by request for Wednesday evenings or special events. Please email childcare@saintmarks.org to make arrangements. Childcare may be cancelled for special events if sufficient reservations are not received 24 hours prior to the event.